My name is Eileen Sandá. I grew up in Vágur, Suðuroy, Faroe Islands and now I live here again after living in Denmark, Greece and Tórshavn since I was young. I work as a Tourism Coordinator in Suðuroy. 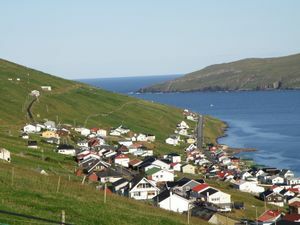 I find the internet as an excellent way to find information about a destination, and I would like to contribute to share information about the Faroe Islands and escpecially about my island, Suðuroy, which is not so much visited by tourists, and that is a great loss for the people who travel to the Faroes and don't visit Suðuroy. The island is very special and different from the other. Even the people here are said to be different from the rest, we speak a diffent dialect and are said to have a different temper than the people from the northern islands. Suðuroy is more green the the other islands, that is due to the fact that the Faroe Islands are vulcanic islands and consist of three layers of lava. Suðuroy consists of the first and second layer, while the rest of the islands consist mostly by the second and third layer of lava. Because of this coal can only be found in Suðuroy. There were many coalmine here in Suðuroy, in the northern part of the island:Hvalba, Trongisvágur and Fámjin. But only one mine is still active, it is in Hvalba, and the coal workers are working in an old fascion way. Tourists can visit this coal mine by contacting the Tourist Information in Hvalba, phone: +298 237575 or the Tourist Information in Tvøroyri, phone: +298 611080. In Fámjin the first Faroese flag is hanging inside the church there. In Suðuroy it is very easy to reach most of the great natural sceneries, because roads are made to these places. The reason for that is sometimes by coinsidense and sometimes because of the British military, which made roads to places, which were suited for watching for enemy ships, submarines etc. This is the fact for Eggjarnar south of Vágur. There are two co-called Eiði west of Hvalba, which both have roads which takes you all the way to these beautiful places. Vágseiði west of Vágur also has a road all the way to the coastline. Beinisvørð, which is the second highest vertical cliff (in the sea) is easy to reach by car. Beinisvørð is the mountain west of Sumba, you can drive up to Hesturin from Sumba and park there, walk to the edge (and don't go to far) and watch the fantastic scenery on the westcoast. In clear weather you can see many of the other islands from this place. This page was last edited on 28 November 2011, at 15:40.